UPDATED: Australia has cancelled their coastal Tsunami warning, but it remains in effect - at least for now - for the Cocos and Christmas Islands. Based on the magnitude, any tsunami generated is likely to be small. 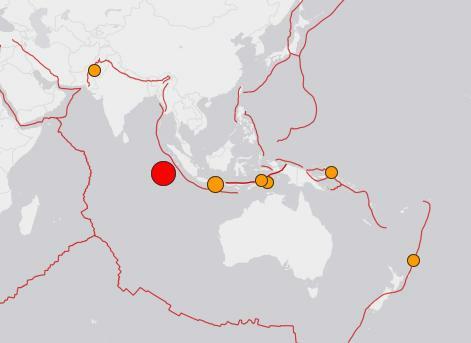 A major, very shallow (10km) earthquake has struck the Indian Ocean about 500 miles south of Sumatra, and a tsunami watch has been issued for Western Australia. At this point no tsunami has been observed, and this is just a watch. I've no word on warnings for the island of Sumatra. This is an Indian Ocean event, and given its magnitude, should pose no threat to interests in the Pacific. 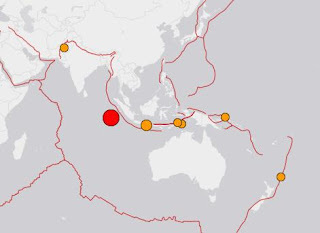 An undersea earthquake of magnitude 7.9 has occurred at 11:49 PM AEDT on Wednesday 02 March 2016 near SOUTHWEST OF SUMATRA, INDONESIA. AT THIS STAGE NO TSUNAMI WAVES HAVE BEEN OBSERVED THAT MAY THREATEN AUSTRALIA. The Joint Australian Tsunami Warning Centre is closely monitoring the situation and will advise immediately if there is cause for concern. Although earthquakes and tsunamis know no season, March is Tsunami Preparedness month, and we'll revisit the threat and what you can do to prepare later this month.